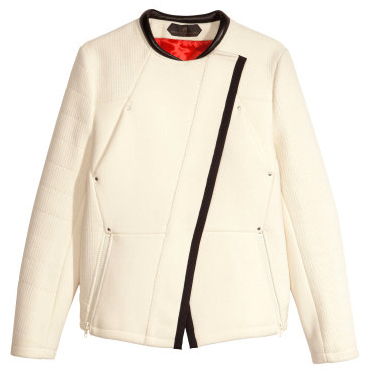 This spot-on structured wool motorcycle jacket is still another reason to give thanks for the awesomeness that is H&M's new shoppable site. It's not available in stores, but if it were, it undoubtedly would be sold out everywhere. P.S. It's a little oversize, so you may even want to order a size down. That is a great find!!! Love it! Wow, I am in love with that jacket!! Help! I bought the jacket with featured leather motorcycle pants which are cool, but short. I don't have thigh high boots-marlien, how would you style them? I would wear them with ankle boots or pumps. Did you try that? Hey Marlien - love your blog (and often purchase items from your well -curated selection). I know this post is from a while ago, but I recently bought this jacket in a 6 (I'm normally a 4 or a 6). It's a little boxy on top, not overly huge, but not sure if that's the look or if I need to size down. Also, do you wear it zipped up or leave it open? Yes, I too find it boxy and slightly big. I am also normally a size 4 or 6, and got the 6. But over a sweater it will be fit nicely rather than snugly. You could size down though id you prefer a more fitted fit. I leave it open, zipped and often just slung over my shoulders.